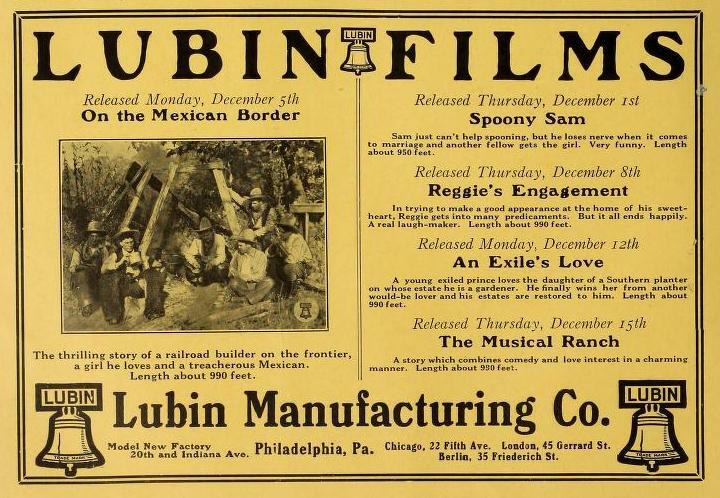 De la película On the Mexican Border (1910) transcribo dos breves recuentos de la cinta, así como dos anuncios de la Lubin Manufacturing Company, productora de la película. En el anuncio publicado en The Film Index se menciona su estreno para el 5 de diciembre de 1910. On the Mexican Border. EU (Lubin) 1910. ¿1 rollo? Western. La hija de un ranchero es raptada por un malvado mexicano, pero su novio la rescata con ayuda de unos cowboys. It all started when the transcontinental railroad decided to run a branch line up through the wild country right to the Mexican border. Phil Scott had charge of the survey and he met and fell in love with Bessie Davis, whose father was a small rancher. Bessie and her sister, Nell, often came to the survey line to watch the young engineer and they came under the notice of Pedro Ramirez, a Mexican whose reputation was decidedly evil. To Ramirez’s admiration for Bessie was added a desire to be revenged upon Phil, who had resented the Mexican’s insolence on more than one occasion. By abducting Bessie a double purpose would be served and Pedro sent his sister to tell Bessie that her sweetheart had been hurt and was calling for her. All unsuspecting, Bessie follows the girl and unhesitatingly enters the abandoned shack where Pedro is waiting for her. Bound, gagged and lashed to a beam Bessie is left alone to break her spirit while the plotters take themselves off. Meanwhile she had been missed and Nell finds Manuelita’s gaudy scarf that the girl in her haste forgot. This gives the clue and she and her father, together with Phil, start out in search. Nell goes in search of the Sheriff and the father to the round-up camp of Bar-B-Bar ranch while Phil follows Bessie’s tracks. He reaches the old cabin and his eye is attracted by a bit of white fluttering from a stove pipe hole. Bound as she was Bess was able to push the short length of pine from the hole and tearing a ruffle from her skirt, she waves it as a signal. In a moment Phil is inside the hut releasing his sweetheart and a moment later the boys come up and capture Pedro as he is returning to hi« victim. There is promise of short shrift but the Sheriff and his posse ride up in time to rescue the Mexican and lead him away to stand trial for his offense and the cowboys turned their attention to congratulating Bess and Phil.—Released December 5. 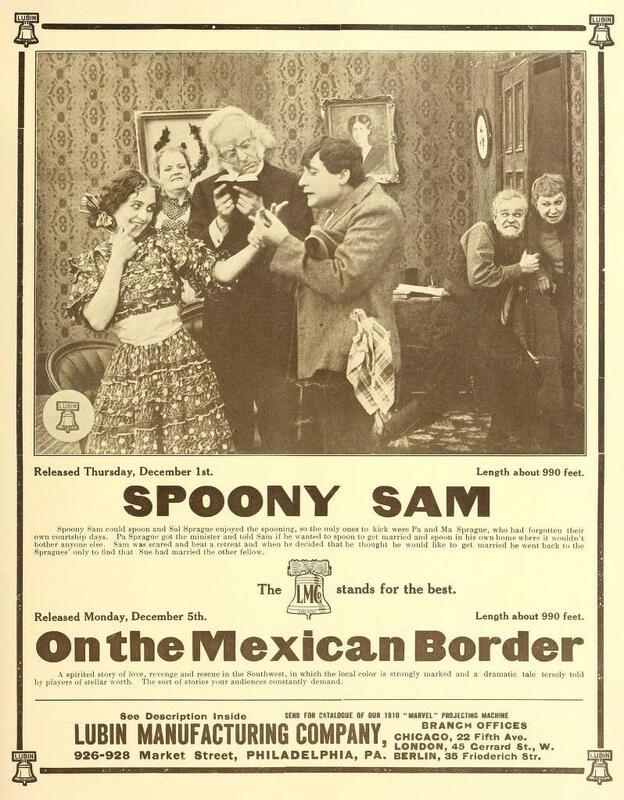 La anterior sinopsis también se publicó en The Moving Picture World del 10 de diciembre de 1910 (Vol. VII, No. 24, p. 1367). What may be termed a typical border drama, with the jealousy of a Mexican as the cause for a good deal of disturbance. A girl is carried away and tied to a post in a shanty, while her kidnapper goes out, expecting to come back and work his pleasure with her. She manages to tear a piece from her white skirt and waves it through the stove-pipe opening. She is rescued and her kidnapper is captured and would have been lynched but for the timely arrival of the sheriff. As has been pointed out before, the pictures representing girls carried away by ruffians should be kept out of every program. Such scenes are much too suggestive. Girls struggling with ruffians or carried away to their lairs smack too much of the former methods of carrying away women whenever they chose. The restraint which led the producers to turn the villain over to the sheriff instead of showing a lynching is to be commended. So much, at least, of the old type of bloodthirsty ruffianism has practically disappeared from the screen, to the great improvement of the pictures. If the carrying away of women and girls is suggested instead of shown producers will take another forward step.